Augustus E. John (Welsh-British, 1878–1961), The Way Down to the Sea, 1909–11. Oil on canvas, 29⅞ × 26⅜ in. (76 × 67 cm). “Further Impressions of the International Show,” New-York Tribune, March 9, 1913, 2:6. Gwen and Augustus John, ed. David Fraser Jenkins and Chris Stephens, exh. cat. (London: Tate Publishing, 2004), 129. In 1910 John traveled to Martigues, in Provence, France, where he lived through 1928 and developed his Post-Impressionist style in a series of landscape and figure compositions. But portraits comprised the bulk of his paid work, and his list of esteemed sitters included the poet Dylan Thomas and the British army officer T. E. Lawrence. He was elected an Associate of the Royal Academy in 1921 and a full Member in 1928, the same year he sold his house in Provence and returned to London. 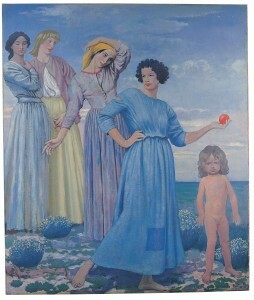 Though his style eventually became outdated, he maintained his reputation as one of Britain’s leading artists until his death in 1961. See Gwen and Augustus John, David Fraser Jenkins and Chris Stephens, eds., exh. cat. (London: Tate Publishing, 2004). Michael Holroyd, Augustus John (New York: Farrar, Straus and Giroux, 1996), 332.